Bruce Campbell Explains Why Freddy Vs. Jason Vs. Ash Crossover Didn’t Work Out. Although the idea was first proposed in the mid ’80s, it took until 2003 before the world finally got a crossover movie featuring premiere slasher villains Freddy Krueger and Jason Voorhees. Entitled simply Freddy vs. Jason, the film incorporated the mythologies of both the Nightmare on Elm Street andFriday the 13th horror franchises in an attempt to craft a believable scenario for the two murderous titans to clash within. Whether Freddy vs. Jason successfully accomplished that task is obviously a matter of personal opinion, but what can’t be debated is that the movie was a smash success, raking in nearly $115 million worldwide on a budget of only $30 million. Naturally, this quickly led to rumors that a sequel was in development, and would introduce a third big horror name into the mix. Which character it was set to be varied, but the one that seemed closest to actually happening was Freddy vs. Jason vs. Ash, which would have combined the Springwood Slasher and the Crystal Lake Killer with everyone’s favorite chainsaw-wielding badass. Sadly, the Freddy vs. Jason vs. Ash idea never made it out of development hell, and despite the first film’s financial success, a sequel to Freddy vs Jasonseems unlikely to ever happen at this point. That said, interested fans did at least get to see the three characters clash in a 6-issue Wildstorm comic book series. That comic series eventually got a 6-issue sequel series, Freddy vs. Jason vs. Ash: The Nightmare Warriors. Quote: I’ll be honest with you. I’m not real interested in crossovers. One of the main reasons why ‘Ash vs. Jason vs. Freddy’ did not come to pass is because we couldn’t control any other character other than Ash. That felt like a creatively bankrupt way to go. Not to mention, you’re splitting the proceeds three ways with partners you might not want. Aside from the fact that Campbell seems to have been unexcited about the idea overall, it seems like the main culprit behind the lack of a Freddy vs. Jason vs. Ash film existing is that old Hollywood standby: money. That issue is actually why a FvJ project didn’t happen sooner, as back when the notion was first floated in the 80s, studios New Line and Paramount couldn’t come to an agreement as to which side would have creative control or how any potential profits would be distributed. By 2003, that was no longer an issue, as New Line had acquired the rights to Jason from Paramount. 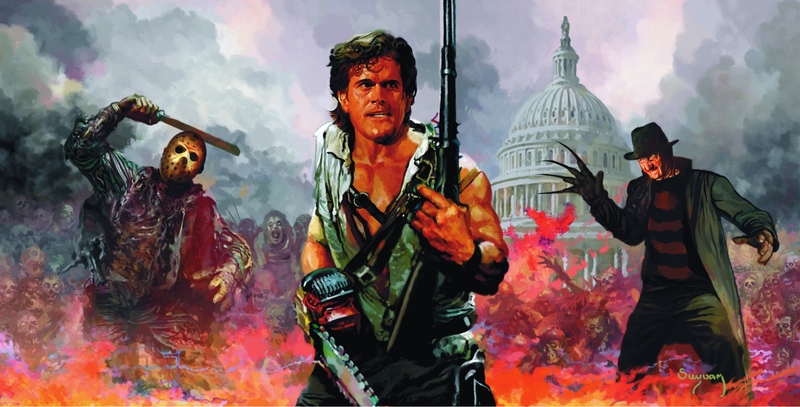 Adding Ash into the mix would’ve just muddied those waters right up again, as while Sam Raimi and crew own the rights to the first two Evil Dead films, they don’t own Army of Darkness, hence why Armyhasn’t been — and seemingly will continue to not be — directly referenced in Ash vs Evil Dead.